I woke up this morning feeling great and happy to have the life I have. I chatted with my sister online for a bit and then went outside with the kids to check on the chickens. 3 eggs this morning. This just doesn’t get old. It is so exciting to see these eggs just materialize. It is really cool. The weather was beautiful, finally it is cooling off here. So the girls played outside and I nursed Justus while we waited for Ron to get home. After being outside for about an hour we came inside for breakfast. I figured I would make an attempt at crepes. Crepes are something that I love and have been missing since being GF. But this morning I decided to wing it and give it a try. Unbelievable they turned out perfectly and I had no recipe that I was working with. Here is what I did. I mixed it all up playing with the flour and hemp milk to get the right runny consistency. I melted some margarine in a large non stick pan with rounded edges. I poured in about 1/3 of the batter and swirled the pan to get a thin layer. I let it brown slightly and flipped it. For the filling I defrosted some mixed berries and added some sugar. 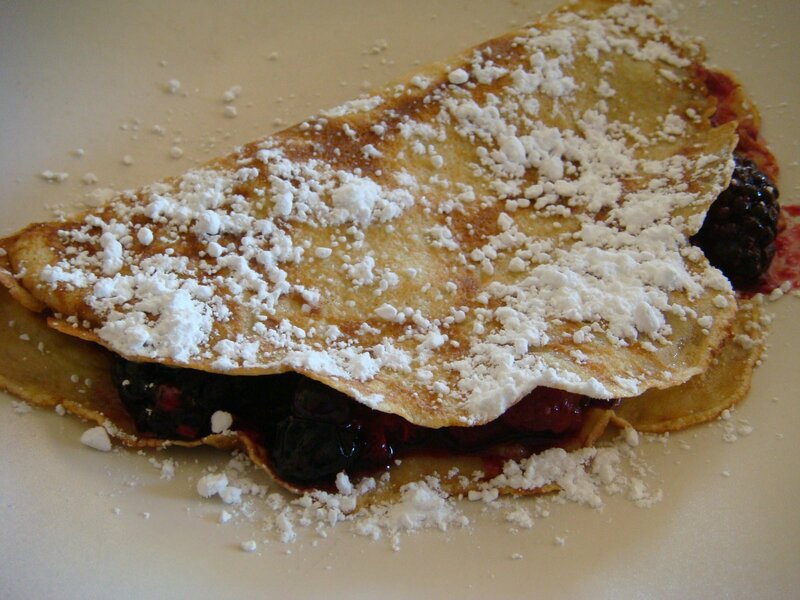 A couple spoonfuls of that, fold the crepe over and sprinkle with powdered sugar. This was really really good and still gluten and dairy free! I honestly can’t believe it. What a great start to an already great day.